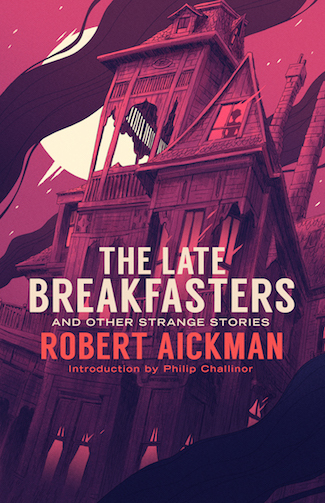 One of the preeminent writers of weird fiction, Robert Aickman is celebrated for his unsettling and often ambiguous "strange stories," but he once wrote that “those, if any, who wish to know more about me, should plunge beneath the frivolous surface of The Late Breakfasters,” his only novel, originally published in 1964. Never before published in the United States and long unobtainable, Aickman's odd and whimsical novel is joined in this omnibus volume by six of his finest weird tales (two of them making their first-ever American appearance): “My Poor Friend”, “The Visiting Star”, “Larger Than Oneself”, “A Roman Question”, “Mark Ingestre: The Customer's Tale”, and “Rosamund's Bower”, as well as a new introduction by Philip Challinor. Robert Aickman was born in 1914 in London. Aickman is remembered today for two very different accomplishments: as the co-founder of the Inland Waterways Association he played an instrumental role in preserving and restoring England’s canal system, and as an author and editor he established himself as one of the most important figures in the history of weird fiction. His earliest stories were published in We Are for the Dark (1951), a volume that featured three tales by Aickman and three by Elizabeth Jane Howard. His first solo collection would not come until Dark Entries (1964), a volume that would be followed over the next twenty-one years by six more original collections of tales that rank among the finest and most influential in the genre. Aickman was also the author of two volumes of autobiography, including the fascinating The Attempted Rescue (1966), as well as the novel The Late Breakfasters (1964). A novella, The Model, was published posthumously in 1987. Aickman also edited eight volumes of the Fontana Book of Great Ghost Stories series between 1964 and 1972. ​Aickman was a recipient of the World Fantasy Award and the British Fantasy Award, though in his lifetime he did not receive all the recognition he was due, particularly in the United States, where most of his works were never published. Since his death in 1981, however, his reputation has continued to grow, and in recent years he has been praised by Neil Gaiman, Ramsey Campbell, S. T. Joshi, Peter Straub, among many others.